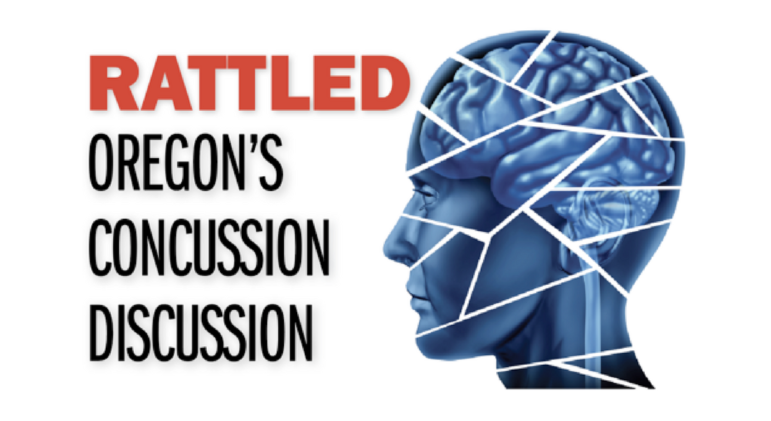 The “Rattled” project’s data analysis showed that Oregon football programs at schools with athletic trainers were three times as likely to document concussion protocols than schools without trainers. 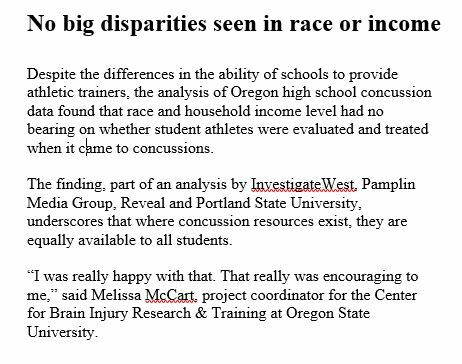 That’s one of the takeaways from an analysis by InvestigateWest, Pamplin Media Group and Reveal, which reviewed “return to play” records from 119 public high schools participating in sports in Oregon to assess how they respond to sports concussions. Some schools, particularly those with athletic trainers, take a preventative approach, screening many more students for possible concussions than expected. Others appear to keep records only for concussions diagnosed by doctors, meeting the standard required by law but not rigorously documenting the students’ paths to recovery. The scene painted by officials at smaller schools — ones in which athletes line up for care while a single, part-time employee offers treatment — underscores how cash-strapped schools might struggle to provide for athletes. The difference was starkest in football. Over the two-year period, we counted 566 football concussion evaluations at schools with athletic trainers and 34 at schools without. Controlling for enrollment/roster differences, that translates into a season-long rate of concussion evaluations of 9.7 percent of football players at schools with athletic trainers and 2.4 percent at schools without. For example, Philomath High School, a Benton County school that does not employ a full-time trainer, reported just two concussions in its football program over the 2015-16 and 2016-17 academic years. By comparison, Roosevelt High School, which had the same size roster, on average, as Philomath but employs a trainer, reported six concussions. The investigation’s finding, in one way, is not surprising. Best practice guidelines for athletic trainers call for documenting all interactions with patients, which would lead to more reports of not only concussions, but suspected concussions. The finding also mirrors national studies, including one study led by the University of Colorado that showed schools with athletic trainers were better able to identify athletes with concussions than those without, and also reduced overall and recurrent injury rates. The most rigorous concussion reports came from school districts that contracted with hospitals for their athletic training staff: schools in the Portland Public Schools district, which contracts with Providence Health and Services, and the Hillsboro and Forest Grove school districts, which contract with OHSU Tuality Healthcare. That discovery did not surprise Sam Johnson, board president of the Oregon Athletic Trainers’ Society, who noted that medical environments increase opportunities for reporting systems, and that such systems are something athletic trainers often work without. Looking ahead, David Kracke, Oregon’s Brain Injury Advocate Coordinator, said he hopes to identify and implement nontraditional supports in rural areas to assist schools working with limited resources. That’s important, because a larger percentage of students play sports at smaller schools than at larger ones. For example, data shows that about 6.5 percent of all Oregon high school students play football at schools with more than 500 students, but 12.5 percent play football at schools with fewer than 500 students. That same pattern holds for most other sports, too. Putting athletic trainers in all of Oregon’s high schools has long been an ideal for the Oregon Student Activities Association. Having athletic trainers in schools not only reduces risks to student athletes, but also can help save their parents money, by reducing the number of physician and emergency room visits for minor injuries like sprained ankles, according to Brad Garrett, OSAA’s assistant executive director. Would it be possible to fund athletic trainers at every high school in Oregon? Sen. Elizabeth Steiner Hayward, D-Portland, who introduced the Oregon law that protects recreational athletes, is doubtful. Kracke said a group of advocates in Oregon is in close contact with key individuals in Hawaii who passed legislation in that state to fund athletic trainers in schools. While they’re not yet ready to submit draft legislation for Oregon, they are looking hard at it. Data used in the “Rattled” project was compiled from public records obtained by InvestigateWest, under the direction of Lee van der Voo. Primary analysis of the data was conducted by Jacob Fenton, a data journalist based in Portland. Sinduja Rangarajan of Reveal from The Center of Investigative Reporting independently confirmed portions of the analysis. Special thanks to Mark G. Harmon, from the Portland State University Criminology and Criminal Justice Department, for his advice on modelling that pointed us to this analysis. * This story has been updated to accurately characterize the relationship between OHSU Tuality Healthcare and the Hillsboro and Forest Grove school districts.